We feel immense pleasure in adding a vast variety of Stainless Steel Panels in our product catalog. We are offering Stainless Steel Wall Panel 310 to our clients. Stainless Steel Designer Sheets (SDS) in Mirror Etching, Satin Etching, Hairline finish, Titanium coated, Rose gold, Gold, Copper, Bead Blast, Vibration, and many more colors. Stainless Steel Panel for Dairy & Oil Industries is extensively used in several industries like Oil and dairy sectors for catering diverse needs in an effective manner. 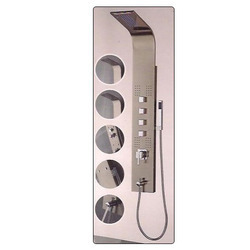 These can be upgraded as per the exact specification provided by the customer. We are engaged in offering panels that are manufactured using stainless steel and mild steel of high quality standards. These are appreciated by the clients for their various features such as High-performance, Rugged design, Simple Installation, saving energy, low maintenance cost.